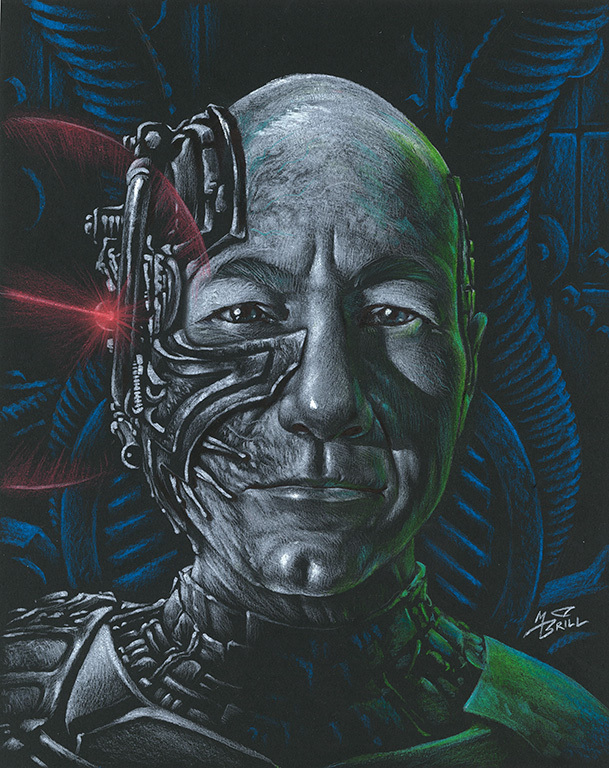 THE BRILLUSTRATOR: Happy Captain Picard Day! In the episode of Star Trek: The Next Generation called "The Pegasus", poor Jon Luc Picard was being teased and embarrassed by his crew because Troi had decided to create a "Captain Picard Day" for the kids aboard the Enterprise. Some fan of the show, with way too much time on their hands translated the Stardate from that episode into the a Gregorian calender date and thus June 16th has been declared Captain Picard Day here in the 21st Century! To celebrate, apparently people all over the world create and share Captain Picard stuff. My cartoonist's group, the C.L.A.W. is no exception. 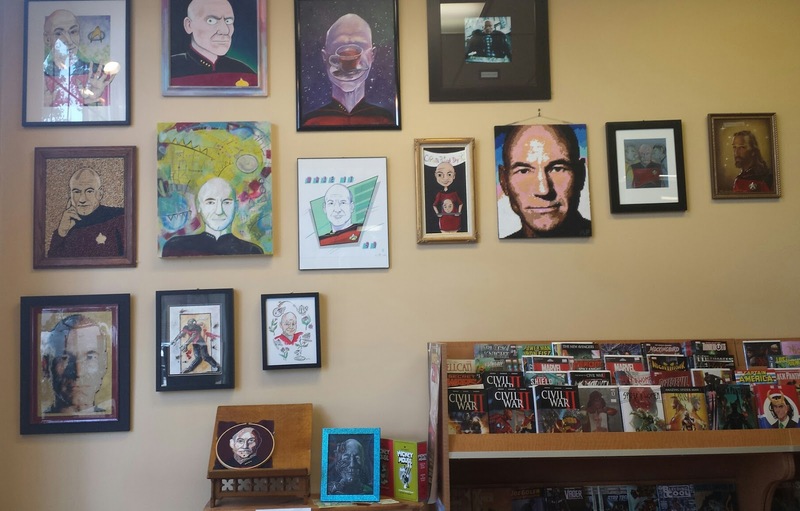 Our newest member, Jennevieve Schlemmer combined efforts with Destiny City Comics owner Michael Fitzgerald to host a "Captain Picard Day" celebration which is now on display at Destiny City! Many fantastic entrees have been made, including a portrait made of beans and rice, a quilted/cross-stitched piece, a painting in which he looks like a Simpsons character and a painting in which the Captain's face is obscured by a cup of his favorite Earl Grey tea! My contribution was a bit dark I suppose, and certainly no one would have dared offer it up at the CPD event aboard the Enterprise! 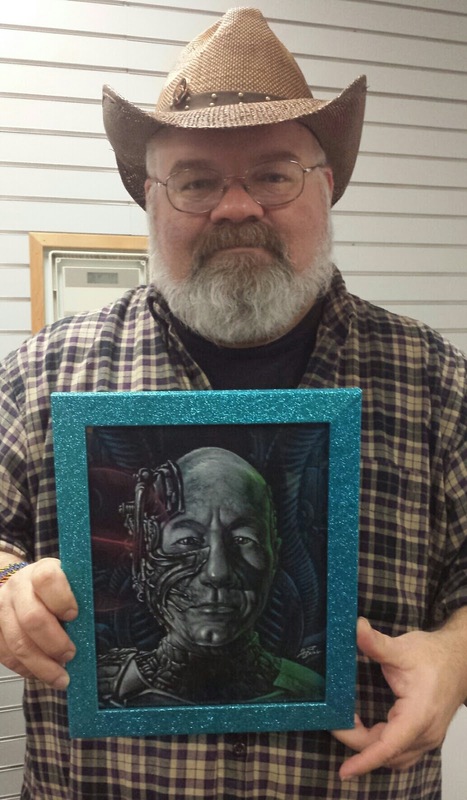 But I had been wanting to do a Locutus of Borg piece like the one above for a while and this seemed like a good time to do it! It will be added to the book of prints that I take to cons. Just to offset the grim nature of the image in this fun and cartoony environment--I added a wildly tacky frame covered in blue glitter! And no--I did not buy a regular frame and violate it in this way; I actually bought it like this!! But it adds a festive quality to Locutus' dour features and looks all futury! Below are pics of me holding the framed monsterpiece as well as a pic of the wall of the Destiny City Comics store (in downtown Tacoma) where this amazing collection of Picardalia can be enjoyed in person! (They are still hanging the art in this pic...so as you can see, mine is not on the wall yet. Enjoy Captain Picard Day! Remember--resistance is futile. Make it so!